Okay, I think I said no more terrain for a little bit, but I lied. I had originally intended to build an outhouse because I thought that would be fun. But then I decided I wanted to test out some Liquitex Stucco gel. And who has ever heard of a stuccoed outhouse? So instead I grabbed the gatehouse that came with the old (sadly, out of production) Citadel Watchtower. I slathered the stucco over the model and after it was try, set to painting it. The it was painted off-white and initially washed with some heavily thinned Bronzed Flesh. I then applied various washes and dry brushes. I'm reasonably happy with it, but Blue in Vermont has achieved much better results than I did! And if anyone has any tips on painting slate roofing tiles, I'd love to hear them. They always seem to come out too blue or too brown (when going for the terracotta look) when I do them! Thanks, although mine didn't come out as good as Blue's, I'm really happy with the product for those reasons! It is. Although I got the bag as damaged clearance when they discontinued them in favor of the current plastic trees. You can still get them as GW just private labeled K&M trees (I bought some a long time ago that came in their original boxes!). Love it! Will set a nice little scene on the tabletop. My tip for blue would be "saturate in the middle," meaning make only your mid-tone straight blue. Add light gray, not white or a brighter blue, to your mid-tone for the highlight. And make your shade tone more black or dark gray than blue. Thanks, I'll try that out! I like the look of it. I just bought some Liquitex Stucco because Blue said you told him to get some. 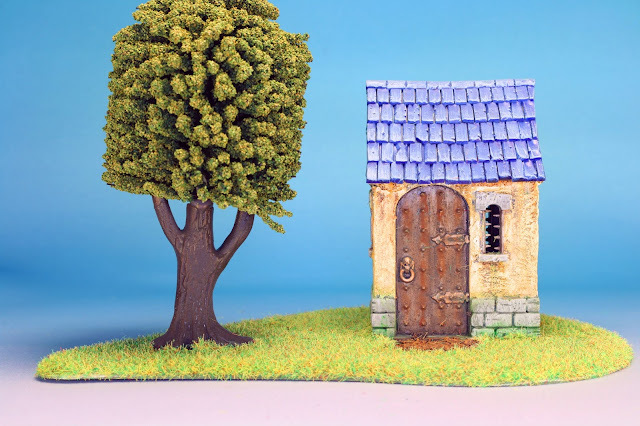 As for the roof tiles, maybe try a pale green highlight over a dark grey. They do make blue roof tiles in China though.